As Session Starts, Will Dayton, DFL Raise Taxes on Minnesota’s Rich? Or Is That Campaign Promise “Inoperable” Now That Democrats Have Control? Pressure is on DFLers to raise taxes from people such as Deb Konechne, St Paul, and her daughter, Eliana Konechne Redfield. Click photo to watch video. 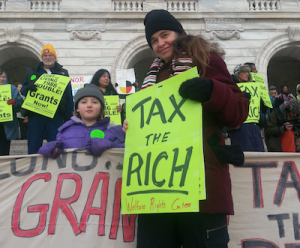 The 2013 Legislative session began Tuesday, Jan. 8 in St. Paul with protesters outside the Capitol in St. Paul demanding that the newly elected Democratic majorities raise taxes on the wealthy. Meanwhile, inside the Capitol, DFL legislators and DFL Gov. Mark Dayton were deciding whether they have the political will to carry out a tax-the-rich promise that has been a traditional part of Democratic politics for decades — a promise the DFL rarely has had the clout to carry out. It’s the question of a session in which Democrats will control the governor’s office and both houses of the Legislature for the first time since the era of Gov. Rudy Perpich: Which Democrats are these; the ones who campaigned to win control in order to pass a Democratic agenda? Or the ones who want to stay in power by avoiding actions that might cost them the next election? If their political “friends” now control the reins of state government, you wouldn’t have known it from the chants of the welfare rights protesters on the Capitol steps. They called on the Legislature — as they do every year — to stop giving away the store to the wealthy and to increase support for the working poor, the children on welfare, the jobless. The protesters were sticking to their platform. The question is whether the DFL will do the same. The discussion about how Democrats will behave now that they have unchallenged control for the first time in a generation has raged since the Nov. 6 election, fueled by the apparent unwillingness of Dayton and DFL leaders to claim a mandate from their victory, and word that Democrats were being urged by leaders to move slowly. That caution was evident on the day after the election when Dayton and DFL leaders held a press conference that was notable not for what they said, but for what they didn’t say. Dayton plans to offer a significant tax reform plan this year — his budget proposal is due later this month — but he refused to specify how much he’d raise taxes on the richest two percent of Minnesotans — a signature promise of his 2010 campaign for governor. Dayton translated his campaign promise into a 2011 proposal to require the wealthiest Minnesotans to pay higher taxes in order to reduce state deficits, predicted to reach $1.1 billion this biennium. Dayton’s proposal, presented to a Republican-led Legislature that refused to consider it, was to raise income tax rates to 10.95 percent and tack on a temporary surtax on the very wealthiest, which would nearly have doubled their top tax rate for a while. But at the post-election press conference, Dayton said he wasn’t ready to unveil a specific tax plan. His legislative allies, incoming Sen. Majority Leader Tom Bakk, and incoming House Speaker Paul Thissen, also avoided the issue. Bakk, in fact, told reporters that he had reached out to the state Chamber of Commerce, a fiscally conservative organization that strongly opposes tax hikes. In the wake of compromises that President Obama struck with Republicans in Washington, D.C., to avoid “the fiscal cliff,” progressives in Minnesota openly worry that Governor Dayton, too, might backtrack on his pledge to raise taxes on the rich. Republican efforts over the past decade to “shrink government” by cutting tax revenues radically changed the state’s traditional tax structure, shifting a much greater proportion of government costs from income taxes, which are considered to be a progressive method of taxation, to property taxes, which are far more regressive. If Minnesota’s budget were a three-legged stool, it would be so lopsided by now that it couldn’t stand up. That’s the metaphor that Dayton’s Revenue Commissioner, Myron Frans, uses to explain the imbalance in the present system. There are three primary sources of state revenue: the sales tax, the property tax and the income tax. Those three “legs” used to be balanced, Frans says, with each one equaling approximately one-third of the total. In 1999, for example, property taxes brought in 30.4 percent, sales taxes equaled 34.7 percent and income taxes equaled 34.8 percent. “Over time,” might turn out to be a key phrase here. If the DFL chooses to go slow on tax changes, they have to worry about losing their majority before real changes can be implemented. According to Frans, Dayton’s plan to raise tax rates on the top two percent of Minnesotans would raise about $300 million over the biennium. But that would account for only 27 percent of the $1.1 billion budgetary hole. So what to do about the rest? One influential opponent of a return to a more progressive tax system could be the Minnesota Chamber of Commerce, which members of both parties seem to be courting. The prospect of DFL politicians catering to the chamber doesn’t sit well with many traditional Democrats, including University of Minnesota Prof. Hy Berman, a labor historian and adviser to the late Gov. Perpich. One group that might give Dayton support is the Joint Religious Legislative Coalition (JRLC), which advocates for fair taxation and social justice issues in Minnesota. “Tax the Rich,” it said. Minnesota Republicans are proposing the state eventually eliminate its tax on Social Security benefits. Currently Minnesota taxes Social Security benefits at the same rate as the federal government, meaning that people whose income mostly relies on social security is not taxed, but those who have additional income are taxed.